Ha ha. The gift of sight. Two eyeball lamps. But, wait a minute. There's something strange about these eyeball lamps. You gaze at your own eyes in the hall mirror, then, unblinkingly, at the eyeball lamps, then at your friend. He is very weird, you think. Ah, relax. You just received clones of your eyeballs in the form of two lamps. Don't worry. Object cloning. It's the latest thing. C'mon! These are your eyes. Aren't they lovely? What a thoughtful gift. Now, here are your eyeballs, I mean Cloned Eyeball Lamps, at night. 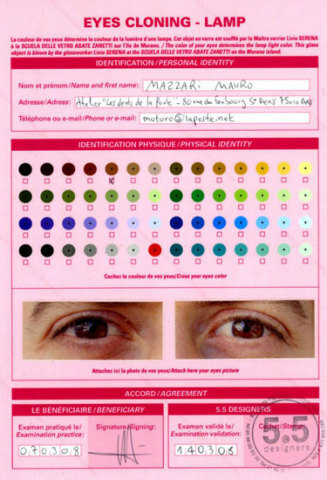 Fill out a form like the one below, attach a closeup photo of your eyes, and then match the predominant eye color to a color on the chart. Then send it with all your Euros to 5.5 Designers. 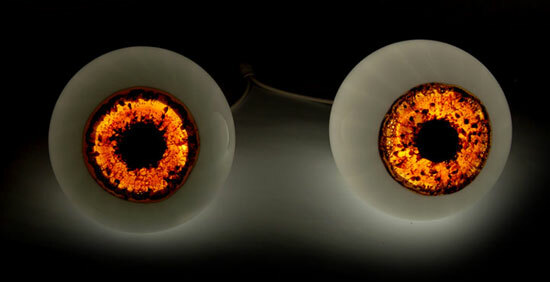 Glassblower Livio Serena, at 5.5 Designers, will create a pair of eyeball lamps to match your eyeballs or those of the person you want to spook... I mean, the person you want to memorialize. Oh my, M. Serena is making a pink eye! Interesting commentary on vanity, human use of dead animals in interior design, a spoof on the practice of cloning, 5.5 sillies at play, or all four? Doesn't matter. The Cloned Eyeball Lamps really light up the place. Really weird. I am not sure how I feel about it other than to say that "the eyes of more than Texas are upon us." Thank you for pointing out that gaffe!